FORT LAUDERDALE, Fla. (AP) — The panel investigating the Florida high school massacre recommended Wednesday that teachers who volunteer and undergo extensive background checks and training be allowed to carry concealed guns on campus to stop future shootings. 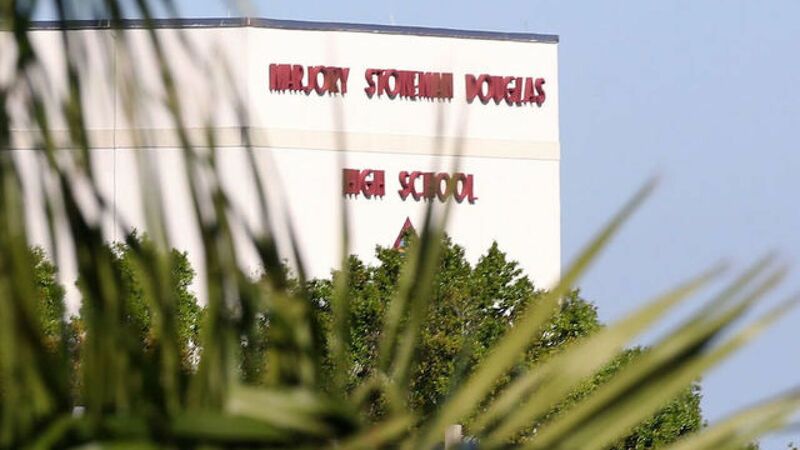 The Marjory Stoneman Douglas High School Public Safety Commission voted 13-1 to recommend the Legislature allow the arming of teachers, saying it’s not enough to have one or two police officers or armed guards on campus. Florida law adopted after the Feb. 14 shooting that left 17 dead allows districts to arm non-teaching staff members such as principals, librarians and custodians — 13 of the 67 districts do, mostly in rural parts of the state. Pinellas County Sheriff Bob Gualtieri, the commission’s chairman, pushed the measure at the Tallahassee meeting. He said most deaths in school shootings happen within the first few minutes, before officers on and off campus can respond. He said suspect Nikolas Cruz stopped to reload his AR-15 semi-automatic rifle five times, all of which would have been opportunities for an armed teacher to shoot him. The state teachers union and PTA have previously expressed opposition, saying teachers are hired to educate, not be police officers. Commissioner Max Schachter, whose 14-year-old son Alex died in the massacre, cast the lone vote against the motion. He said the state should focus on hiring more police officers for campuses and allowing non-teaching staff to carry guns. “We do need more good guys with a gun on campus — nobody understands that and wishes we had more at Marjory Stoneman Douglas than myself,” Schachter said. But arming teachers “creates a host of problems.” The father and wife of other victims, who are not on the commission, also spoke against arming teachers. 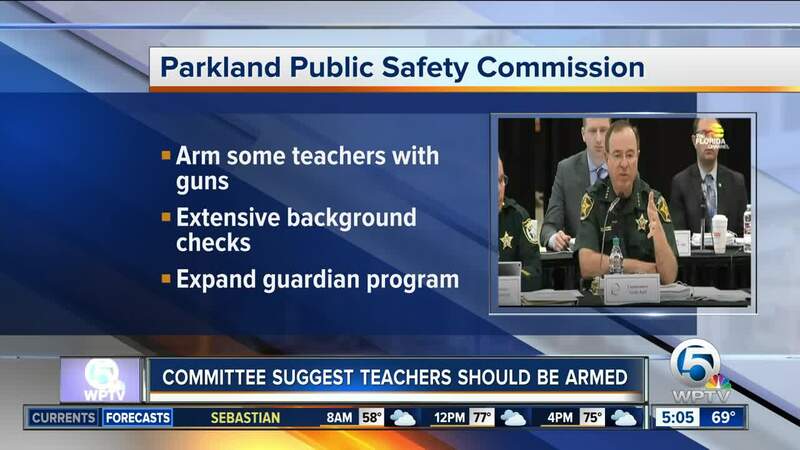 After the shooting, Florida law was changed to allow school districts to train and arm employees other than teachers except those who are former or current police officers, current members of the military or Junior Reserve Officer Training Corps instructors. The 15-member commission, which has been meeting periodically since April, will present a report to Gov. Rick Scott, incoming Gov. Ron DeSantis and the Legislature by Jan. 1. The commission includes law enforcement, education and mental health professionals, a legislator and the fathers of two slain students. Also Wednesday, a judge rejected former Stoneman Douglas campus deputy Scot Peterson’s contention that he had no obligation to confront Cruz. Refusing to dismiss a lawsuit filed by the parent of a victim, Broward Circuit Judge Patti Englander Henning found after a hearing that Peterson did have a duty to protect those inside the school. Video and other evidence shows Peterson, the only armed officer at the school, remained outside while shots rang out. The negligence lawsuit was filed by Andrew Pollack, whose daughter Meadow was killed. Pollack said it made no sense for Peterson’s attorneys to argue that a sworn law enforcement officer with a badge and a gun had no requirement to go inside. Peterson attorney Michael Piper said he understands that people might be offended or outraged at his client’s defense, but he argued that as a matter of law, the deputy had no duty to confront the shooter. Peterson did not attend the hearing. The commission voted Wednesday to condemn Peterson’s actions, calling him “derelict” in his duties. Cruz, a 20-year-old former Stoneman Douglas student, has pleaded not guilty, but his lawyers have said he would plead guilty in exchange for a life sentence. Prosecutors are seeking the death penalty. Posted in Accountability, Advocacy, Arming Teachers, Bus Safety, Department of Education, Education Budget, Educators Protest, Evaluations, Every Student Succeeds Act, Failing Schools, Funding For Education, Higher Education, Janus, Mental Health, No Child Left Behind Act, School Safety, Special Education, Students and Parents Protest, Teacher Shortage, Testing, Vouchers and tagged "Standing Strong for Public Education", #iBelieve, Accountability, Accountability System, Advocacy, Department of Education, Diversity, Education, Education Funding, English Language Learners, Equity, Every Student Succeeds Act (ESSA), Failing Schools, Federal Education Policy, High-Needs Students, NEAExecutiveCommittee, Pensions, Public Education, School Choice, School Nurses, School Safety, State Budget, Students, Testing and Accountability. Bookmark the permalink.